← August Restaurant Round-Up & Giveaway Winner! This is my absolute favorite summer dessert right now. 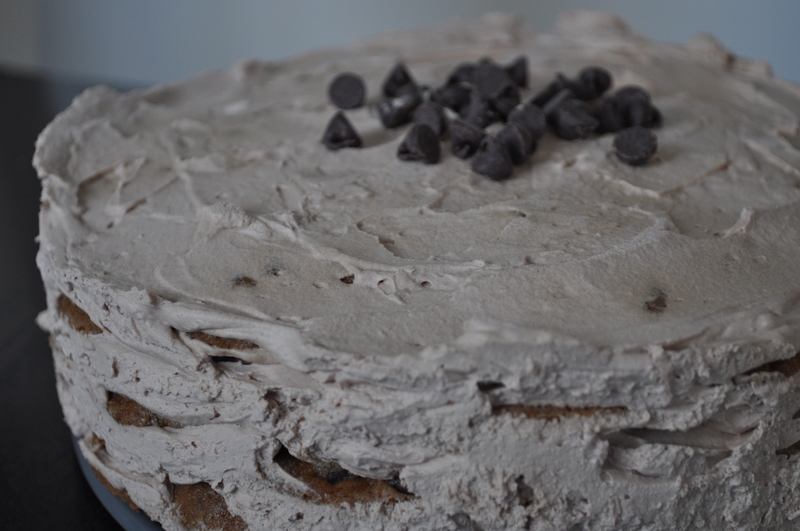 It’s totally over-the-top, with layers of chocolate chip cookies and coffee & chocolate flavored whipped cream. I guarantee you will be running back to the fridge to grab more! It’s so simple to make – just a little whipping and layering, then leave it in the fridge overnight to soften the cookies (this is by far the hardest part). I recently brought this to a bbq and everyone loved it, so I promised I would post the recipe here. I can’t say enough good things about this cake, it’s so delicious! **You will also need an 8-inch springform pan. Using an electric mixer with whisk attachment, slowly whisk together the cream, mascarpone, sugar, coffee liqueur, cocoa powder, espresso powder, and vanilla. Increase speed, and continue whisking until it forms firm peaks. In an 8-inch springform pan, cover the bottom with chocolate chip cookies, even breaking them apart to fill in any big holes. Spread a fifth of the whipped cream on top, then proceed with another layer of cookies. Continue until there are 5 layers of each, ending with a layer of whipped cream. Smooth the top, cover with plastic wrap, and place in the fridge overnight. To remove the cake, run a knife around the outside and remove the sides. Decorate with chocolate garnish in the center if desired. Posted in Recipes, Sweets and tagged barefoot contessa, cake, chocolate, cookies, dessert, icebox cake, mocha, whipped cream. Bookmark the permalink. Sounds way too yummy! Please eat it all before I arrive. Yum! I will try this at Thanksgiving, the next time I have a chance to experiment in the kitchen! You should – it’s soo good!